Send a Grades Message to guardians to notify them when the student has received a specific grade either as an In Progress or a Posted Grade. Grades messages are not sent to students. To start the message click on New in the Message Center. For a Grades Message, the Subject, Body and Text Message fields auto-populate with a sample of content that you could use, including Campus fields that populate based on the recipient. For example, the student.firstName field will populate with the student’s actual first name in each message based on the recipient. Modify this text as desired. The second step of sending a message is selecting which students’ guardians could be included in the recipient list and which grades determine that inclusion. The guardians of selected students who also meet the recipient criteria are sent the message. Available Sections include your sections in the current term and one term previous. Leave All Students selected to include all active students in the selected Section or mark Specific Students to choose individuals. Move students to and from the Student List using the Add and Remove buttons. Add All and Remove All options are at the bottom of the lists. 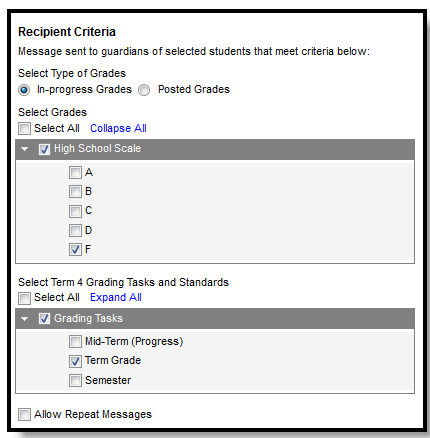 Once you’ve selected students as possible recipients, determine the Recipient Criteria for the message: which grades from which tasks and standards cause a message to generate. Grades – The letter grade the student earned. Options display for the Grading Scale used to calculate grades in the Grade Book. You can send congratulatory Grades Messages as well. Term Tasks and Standards – The Grading Tasks and Standards that are aligned to Categories in the current Term. Middle School select Quarter, High School Select Semester. Always select Allow Repeat Messages. The final step of creating and sending a message is to review recipients and send the message. There is really no difference between Class Message and Grades Message.